I know I've gone a little crazy on the krispy treats lately... but they are just so. good. Plus, I needed to find a way to get my sister to stop hogging all my pistachio butter! ;) I looked around my pantry and the rice krispies stuck out right away. But what to mix it with? 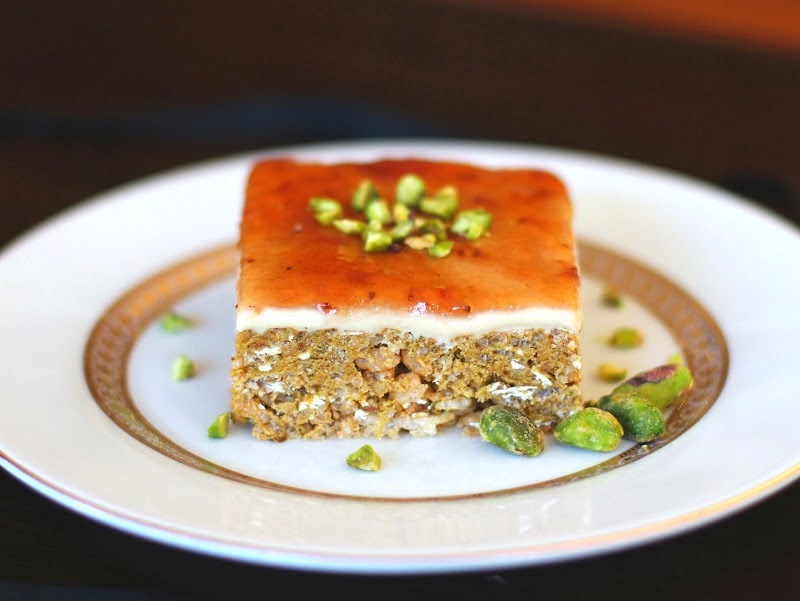 That's when I searched "pistachio" into Foodgawker, only to find a long list of the most amazing-looking desserts (that in itself makes my heart skip a beat). A lot of recipes paired pistachios with citrus, and I thought of lemon! Hmmm... what will take the treats over the top? Frosting! My brain's reaction time between "over the top" and "frosting" was... let's just say, a pretty quick one. I love frosting, always have. I used to eat the Pillsbury frosting out of the tub... by itself. Anyways... I made a fondant instead, as that seemed to suit these better anyways. Still sweet, still decadent, still yum! But something was missing. These needed a burst of color! So I opened the fridge and saw strawberry jam. Would it work? Oh yes it would. And the rest was like a fairytale dream... each bite had the perfect blend of flavors, from the lemon to the pistachio, from the honey to the strawberry. Each ingredient so unique and distinguishable. Each bite was as rich as you would imagine. The delicate crunchiness and the addictive chewiness, the mild sweetness and the aromatic nuttiness. Perfection. 1. Line a brownie pan with parchment paper both ways. 2. In a large bowl, mix together the rice cereal, oats, flax and salt. 3. In a small bowl, add the protein powder and green tea. 4. In a large microwave-safe bowl, stir together the brown rice syrup, pistachio butter, vanilla, lemon and stevia extract, microwave at 15-second intervals, stirring between each one, until mixture is warm/runny. Add the prepared Dry II ingredients, spoonful by spoonful, while stirring, until fully incorporated. Scoop this over the Dry I ingredients and fold with a rubber spatula. When everything is fully incorporated and mixture is even, scoop this into the prepared brownie pan and refrigerate while you make the fondant. 1. In a medium microwave-safe bowl, add the honey and coconut oil and microwave for 30 seconds, or until coconut oil is melted. Stir in the protein powder (it should look like a paste). Scoop this over the krispy treats, then wrap your fingers with plastic wrap and press/push the mixture to the edges of the pan (you can probably use parchment paper too). Refrigerate for 30 minutes. 2. 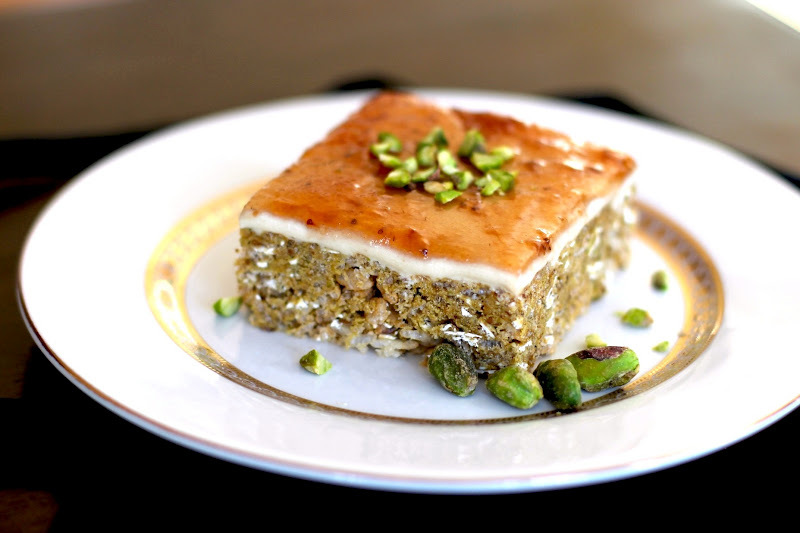 Take the krispy treats out of the fridge and spread on the jam and sprinkle with pistachios. Refrigerate for 30 minutes then slice and serve. Spread on the jam only the day of serving, and refrigerate covered to store. Mmmm crispies...I recently bought some proper authentic brown rice puffs recently and have been wondering how to put them to good use! Lovely pics as always!